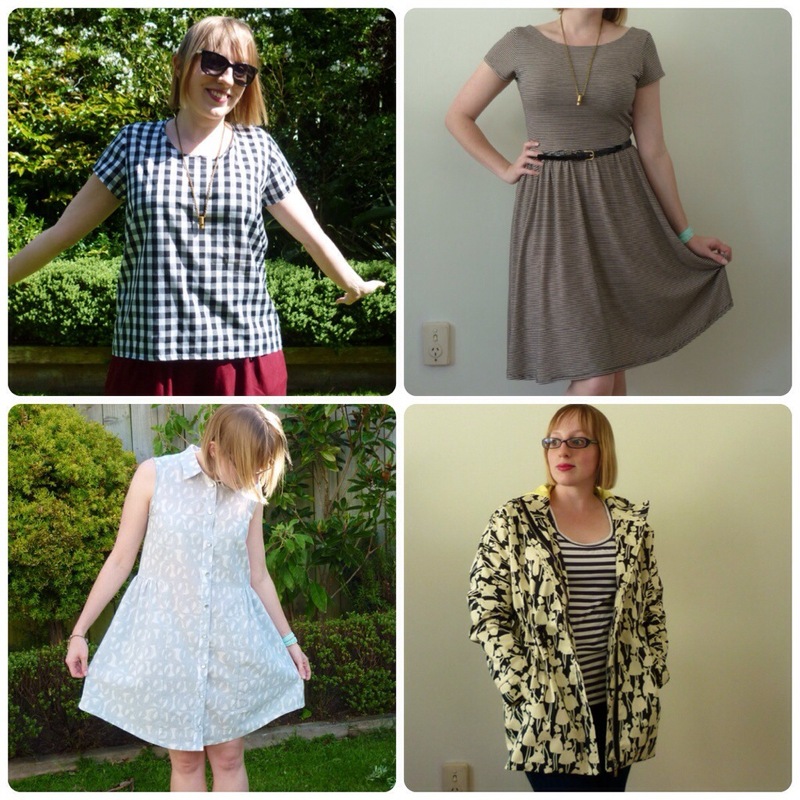 I don’t have many gaps in my wardrobe, but one I really noticed during MMM15 was my lack of ‘nice’ tops. 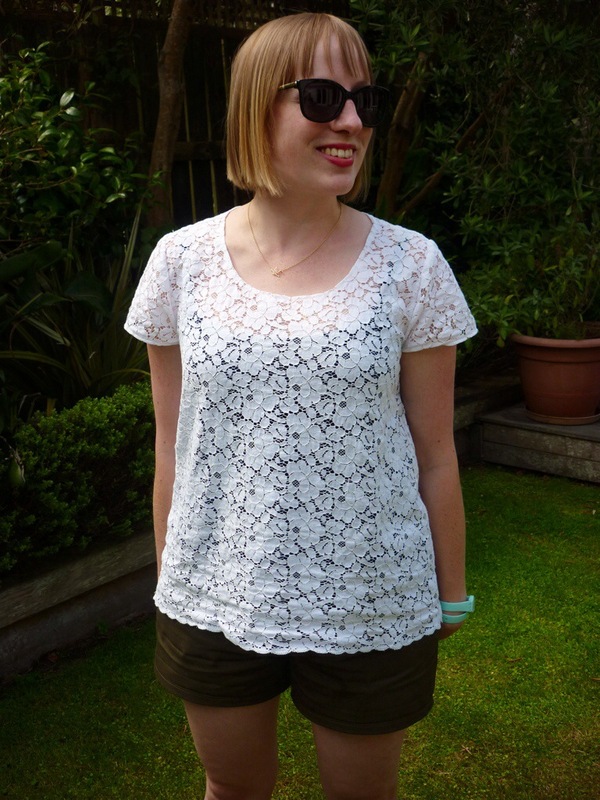 Tops that I can fling on with my skinny jeans and some lipstick and look presentable enough for after work drinks or last minute dinner plans. 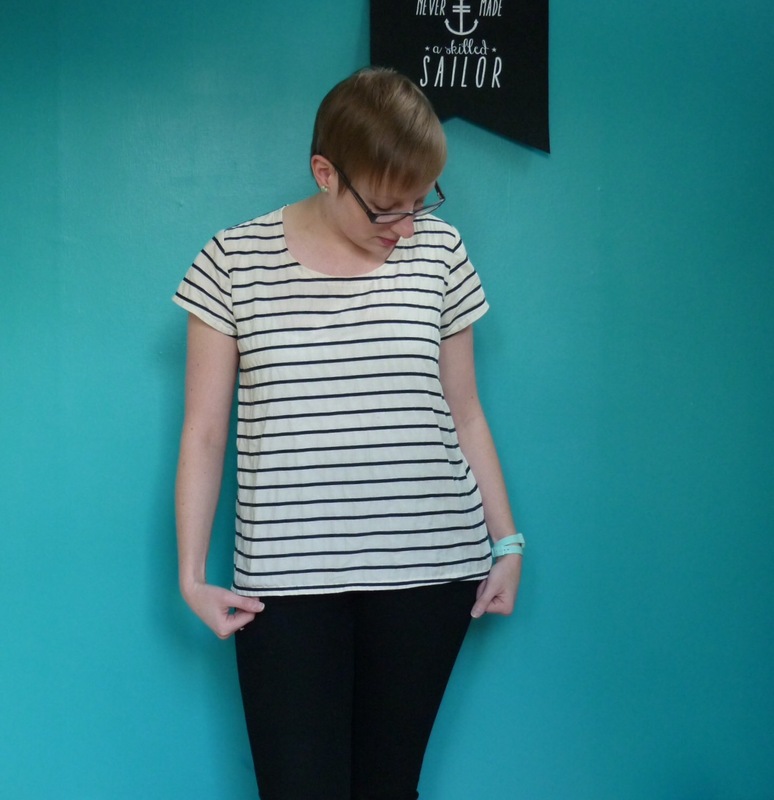 This week I made myself two more Grainline Scout tee shirts (numbers 6 and 7, oh my!) which pretty neatly fill my brief! I’m popping them both in the same post, as I really don’t have much more to say about the construction of the Scout. Both are a straight size 6, with only cosmetic changes. The first version is made up in the best striped cotton I’ve found so far. 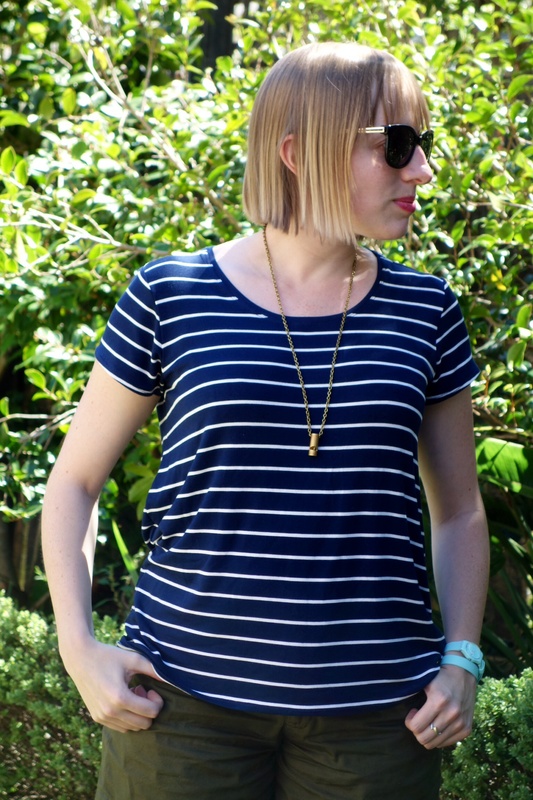 I love a good breton stripe! I bought 3m of this stuff, so expect to see a dress made out of it sometime soon. It was actually a bit if a pain to sew, much more than I expected. 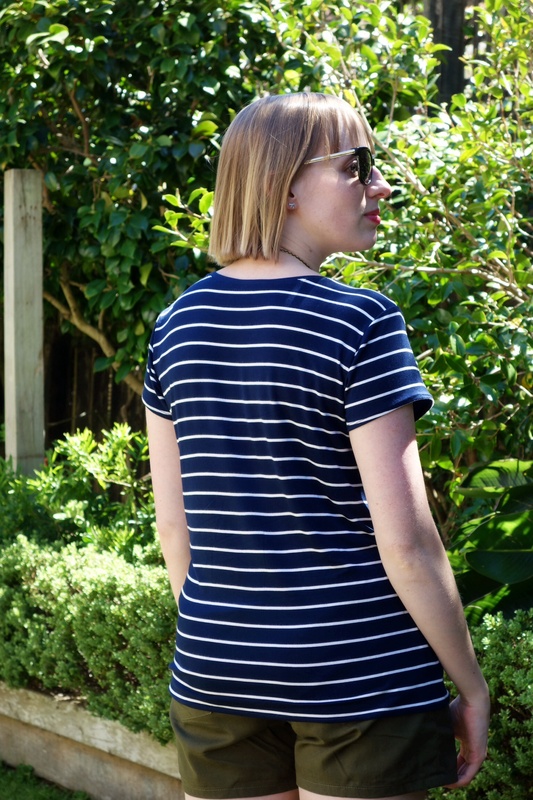 The navy stripes are embroidered onto the cotton in nylon thread, which made ironing tricky. If I had the iron hot enough to get creases out, the nylon stripes would shrink up, making it look like large scale seersucker. As it cooled down it relaxed a bit, but it still looks a bit rumpled. I’ve decided I can live with it! 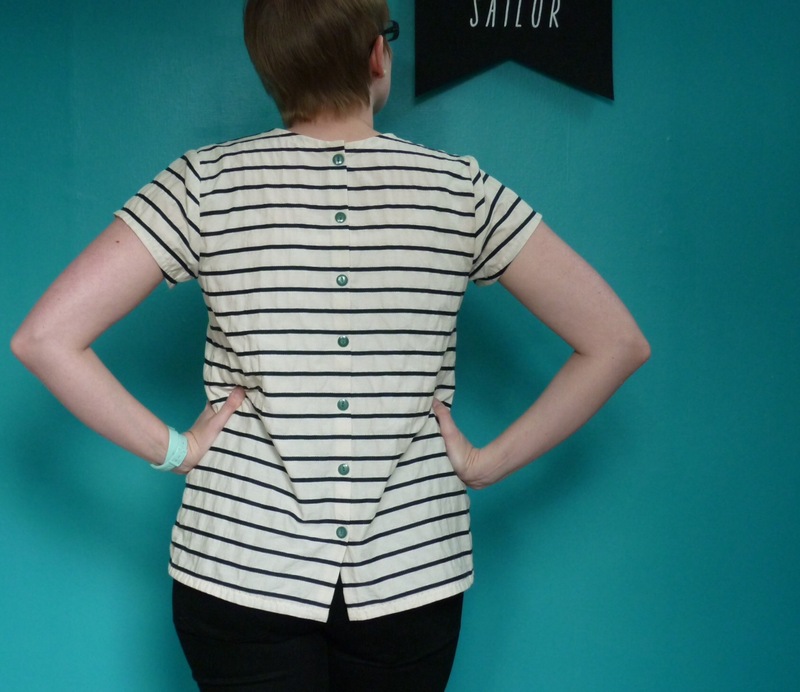 I added a faux button placket up the back (faux in that it has no buttonholes, I just extended the back CB edge, cut it off the fold, turned the edges under an inch and sewed the buttons through both pieces). I love a back button detail! The buttons are gorgeous green vintage ones from the Fabric Warehouse, I really like how they look with the stripes. 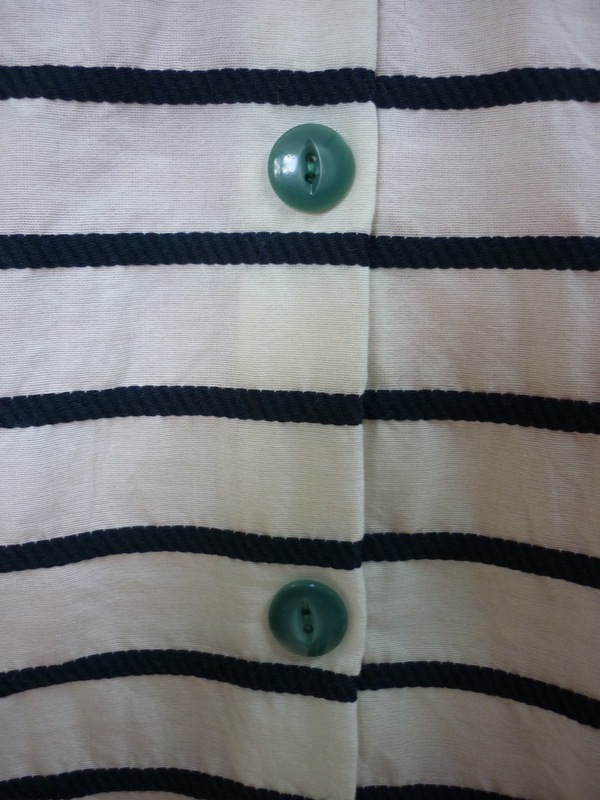 I’m including this photo so that you can see how cute the buttons are, and to show the rope-like texture of the stripes. 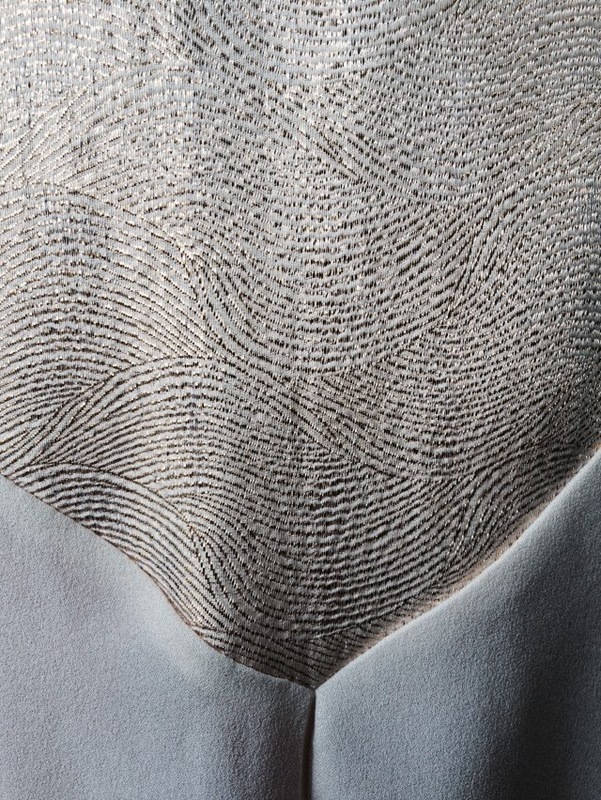 Its pretty cool fabric! 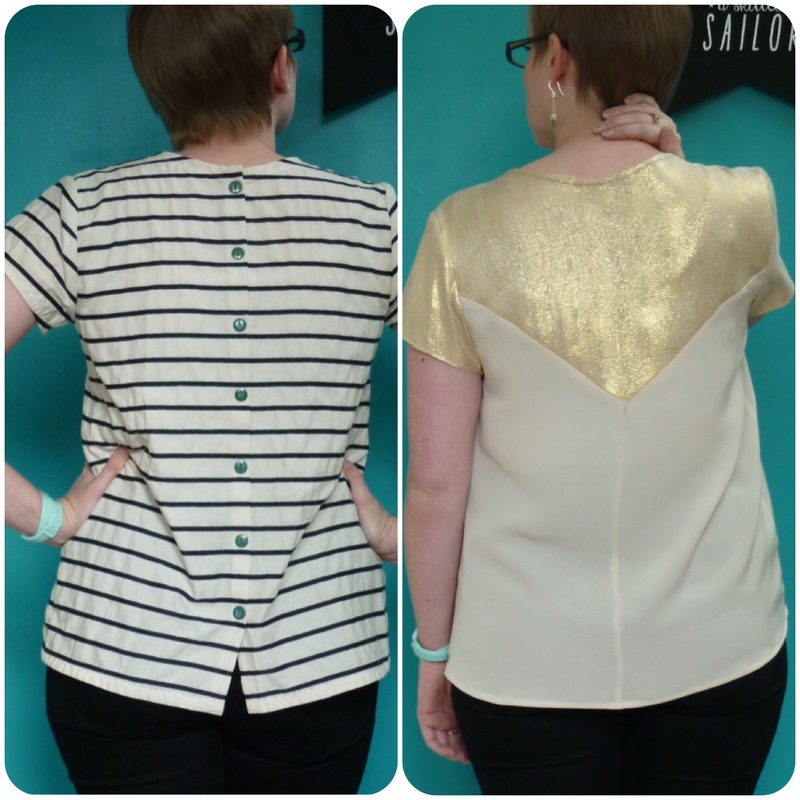 The seams on this shirt were all finished with my overlocker, and the neck and hem are finished with bias tape. Neat, but too dull for pictures! My second Scout is much more dressy, and really quite blingy for me! I’ve had these two fabrics in my stash for ages, so I’m glad I’ve finally used them! The body is cream silk crepe, and the sleeves and neck binding are cream and gold silk. I really need a better camisole to wear under this one, the crepe is so light and clingy. Can you tell I love back details? I really do. I’ve had this idea for a triangular yoke (if thats the right word for it) floating around in my head for a while, and I’m glad it tuned out ok. To get the shape of the yoke, I started at the sleeve notches, and drew a line to the CB at an angle which I found pleasing. There wasn’t any maths or anything fancier than that! 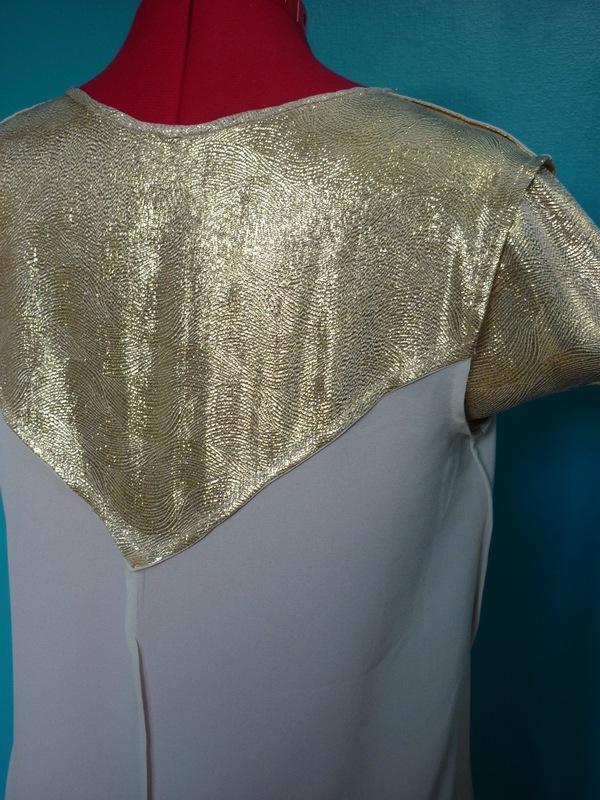 I used french seams for all of the construction of this one, as the gold fabric frayed like a beast. Also because french seams are pretty. I wanted the neckline to be bound rather than faced with the bias tape, so I machine sewed it onto the right side and then slipstitched it to the inside. 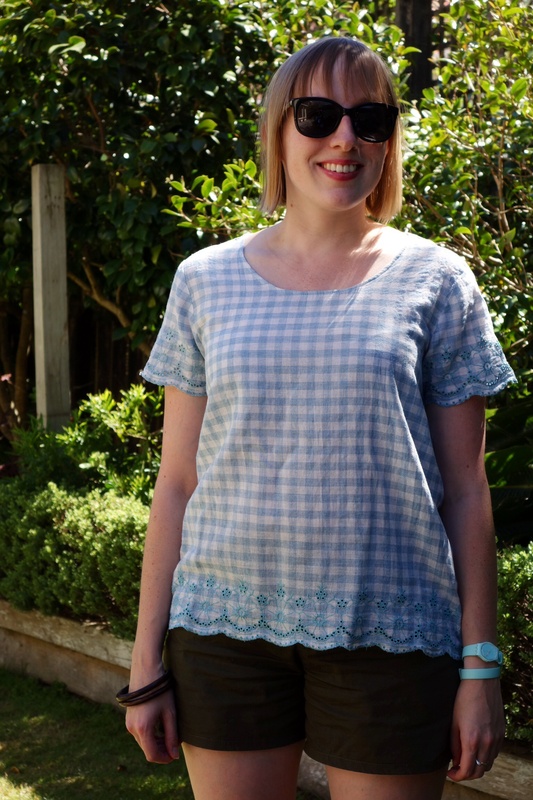 Wellington is absolutely scorching hot at the moment, and I am feeling very grateful for the summer sewing I did over the Christmas break! 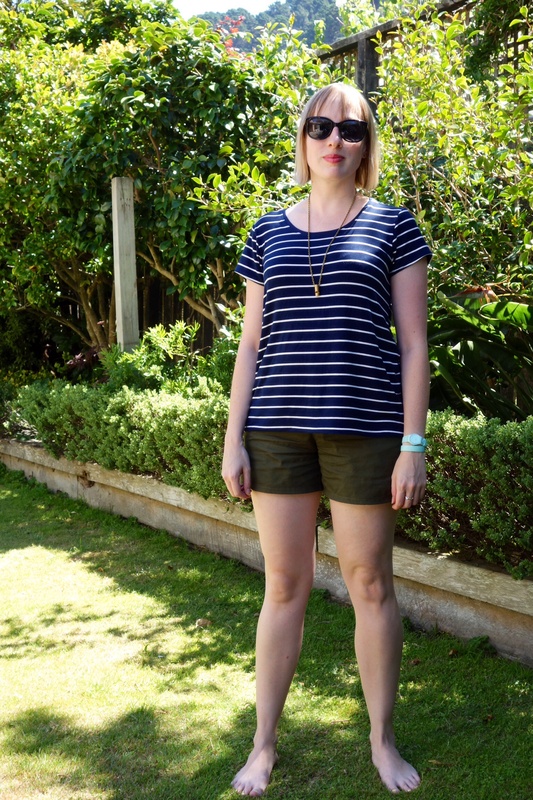 I’ve stuck with the Grainline theme and whipped myself up another couple of Scout tees to go with my Maritime shorts, and also made up a Linden sweatshirt. I’m chucking them all in one post, because I really don’t have much more to say about the Scout, aside from how much I adore it! 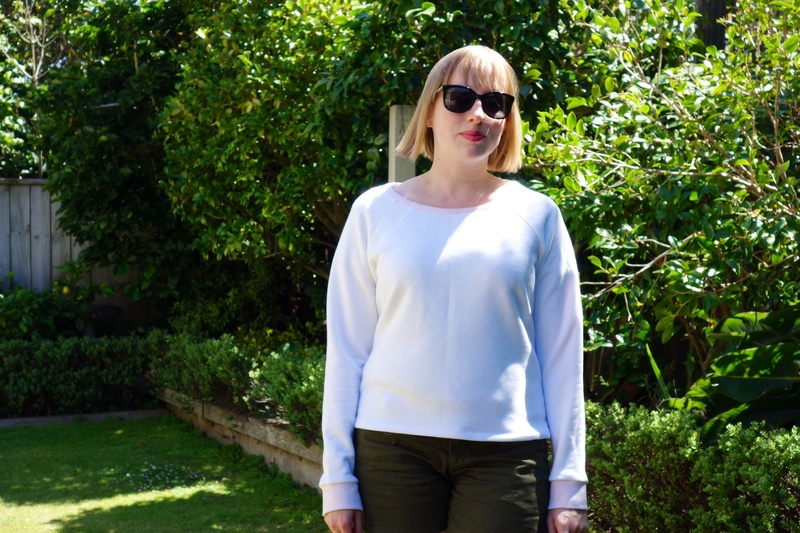 I’ll start with the Linden Sweatshirt, since its one I haven’t made before. 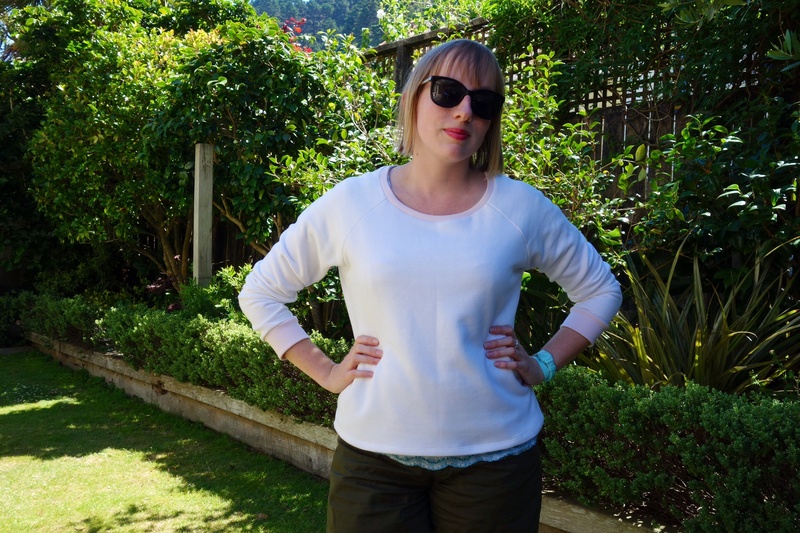 Its a really nice raglan sleeved sweatshirt, it was really quick and easy to sew up. I did have a couple of hurdles with making it though! 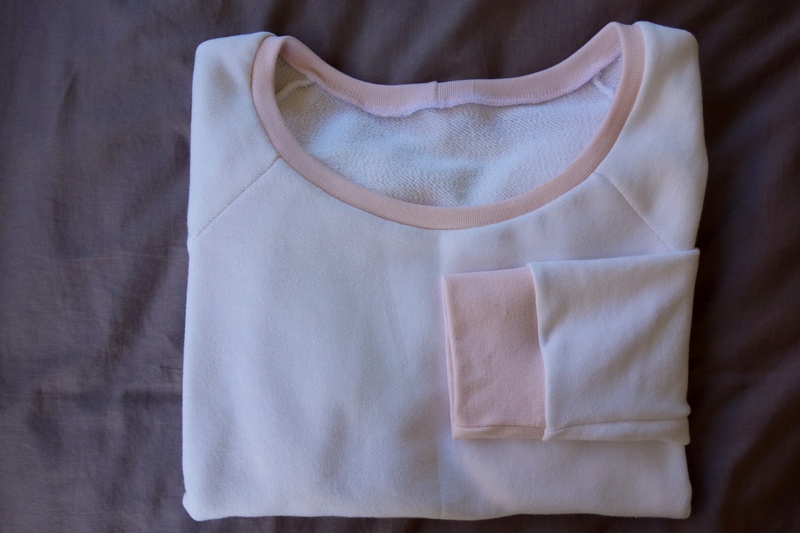 I found this white cotton sweatshirting (is sweatshirting the same as french terry? This is smooth on one side, and loopy on the other) from the Fabric Store, but I had trouble finding ribbing to match. In the end I got some cream/off white ribbing from The Fabric Warehouse, and was quite pleased with the colour combination. Unfortunately, I chucked the ribbing in the wash with some pink silk satin I have for lining my upcoming Victoria Blazer, and dyed it a delicate pink! 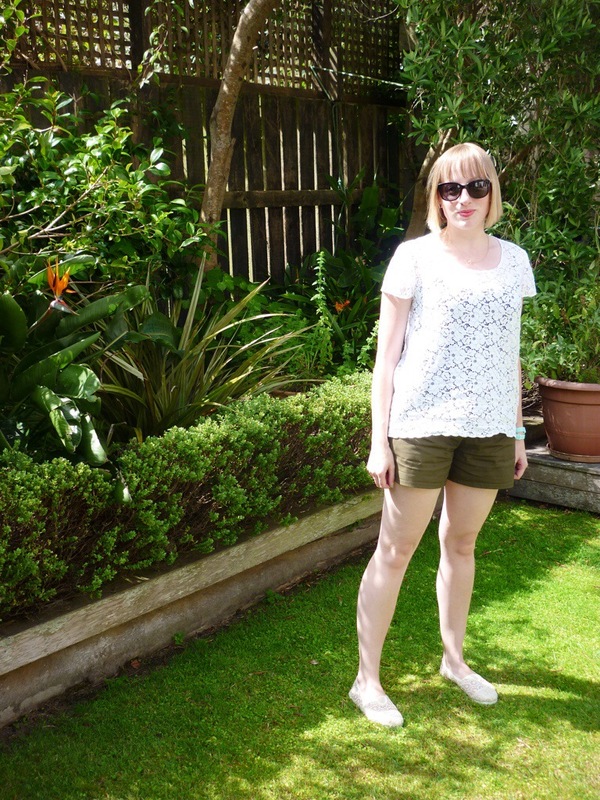 There aren’t many photos of me wearing it, because its just too hot! I decided against adding the bottom hem band, I just folded the hem up by an inch and sewed it with my twin needle. I have some lovely black merino in my stash, just waiting for winter to arrive before it gets made into another Linden! The first of my latest two Scout tees (I’m on a bit of a Scout bender) is the same as the previous one I made. The fabric is an embroidered cotton from The Fabric Store, of course. Its really nice and light, a loose weave almost like muslin. I’m a sucker for gingham, and I really liked the embroidered border, but I didn’t want to make it into a dress or anything which could end up looking a bit Wizard of Oz or rodeo-ish. So a nice simple Scout it became! A knit Scout! I am totally in love with this one, its the tee shirt of my dreams! The fabric is a luscious bamboo cotton knit from Blackbird Fabrics, and it is just the softest, drapiest, most delicious stuff to wear! I bought it as soon as Blackbird Fabrics opened their online store, as I haven’t been able to find a good breton striped knit anywhere. In fact, I was so eager to buy it that I followed the link out of the Sewaholic blog post talking about it to the shop and bought it before I finished reading the post, only to see that there was a discount code at the end! I felt like such an idiot, but when I left a comment exclaiming about my stupidity, Caroline kindly took the discount off anyway. Blackbird fabrics were great to deal with all round, actually. 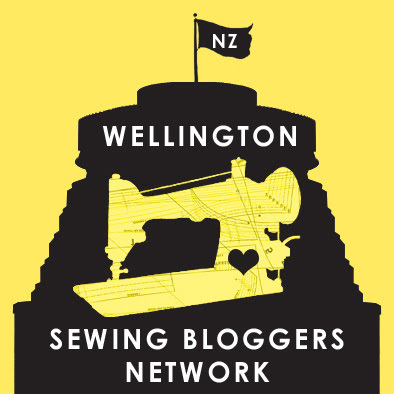 Caroline emailed me regarding a change in shipping procedures to NZ and offered to refund me if I wasn’t happy with the new arrangements, and was just generally lovely and helpful! 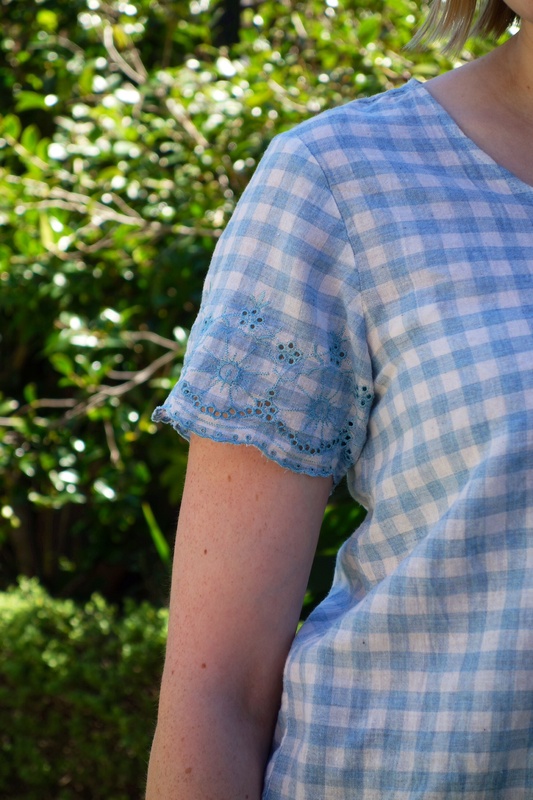 I cut this version out in the smallest size, and then sewed it up with a standard overlocker 3/8″ seam allowance, and it fits just how I wanted it to. Isn’t it nice when things turn out just right? I cut the neckband quite narrow, as I wanted it to be plain navy, so I topstitched it down with my twin needle to stop it flipping over. This is a step I never usually bother with, I just steam the crap out of it and hope it stays in place! Have I mentioned that I love it? I really really do! So far I have spent 2015 eating, watching the cricket (come on Black Caps!) and sewing up a storm. It’s been very pleasant! 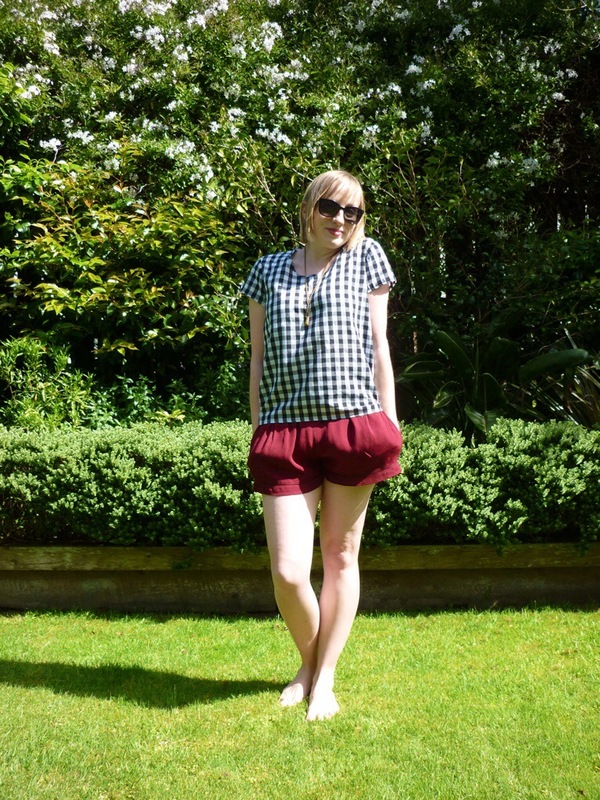 Wellington has been hot and humid for the past week, so I decided it was definitely time to make myself some shorts. 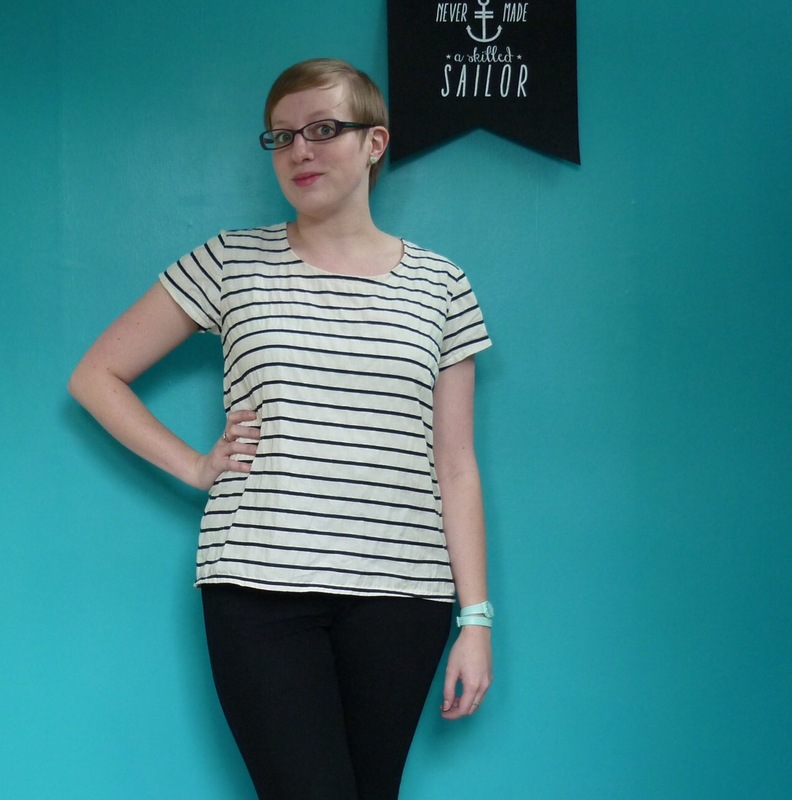 During the post-thanksgiving sale period I bought myself a copy of The Maritime Shorts pattern from Grainline Studio (along with the Linden Sweatshirt pattern, expect to see that sometime soon!). I’m still a bit scared of making trousers, as I don’t know where to start with fitting issues, but I’ve always had such good results with Grainline patterns, and the Moss skirt fits me really well, so I thought I’d give them a crack. I’m definitely glad I did! The fit is spot on, and they came together beautifully. All the fabric came from my stash (thank god, its overwhelming my sewing corner a bit at the moment! 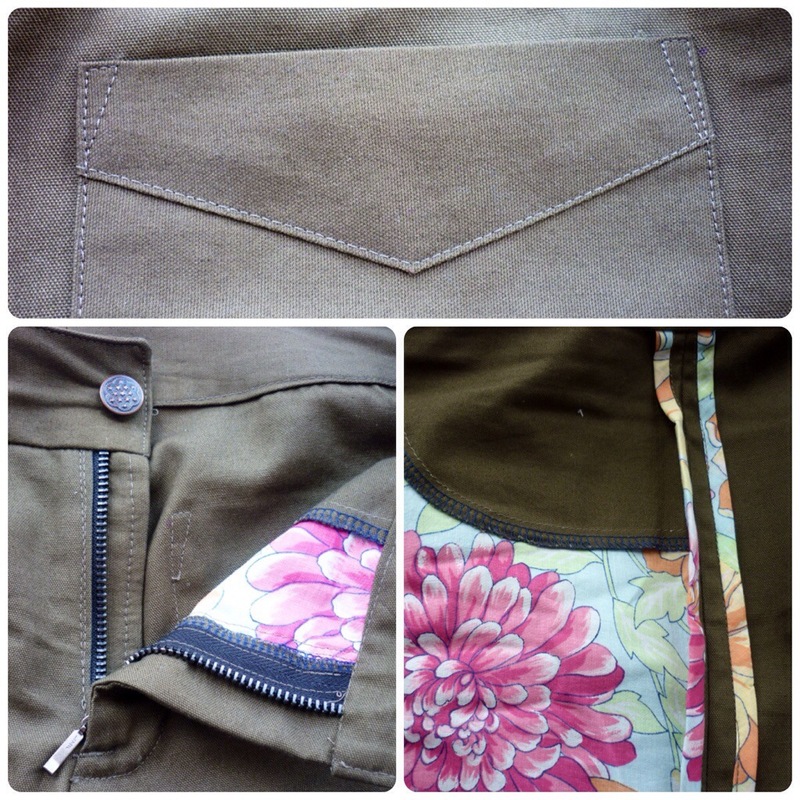 ), I originally bought this khaki cotton drill to make a bag out of. Its nice to wear, but it creases like nothing on earth! I ironed them, sat down for about 10 minutes and then took these pictures, and look at the state of them! Looking at that last picture, it does look like theres a bit of pulling towards the inseam. I wonder if thats always there, or if its just the way I’m standing? 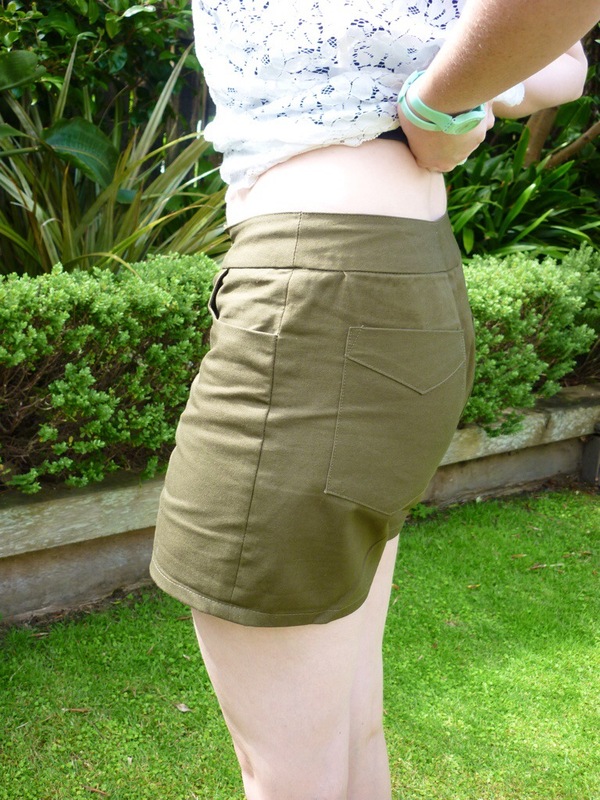 I made these exactly as instructed, except for adding 2″ of length to the hem. I originally planned for them to be cuffed, but I actually really like the length with them uncuffed. If (when) I make them again, I might add another 2″ so that I can cuff them! I used some floral cotton from my stash for the pockets, they make me smile when I put them on. I bound the outer leg seams in the same fabric because I thought it would be cute to have that little glimpse of the binding at the cuffs, but now it’ll probably never be seen! It was still good practice though, I’ve never done bound seams before. I have discovered how much I hate making bias tape…so tedious! I also whipped myself up another Scout tee, just after the epic frustration of my silk velvet adventures. I really do love this pattern, can it be counted as a tried and true pattern after three iterations? I was stoked to find this DKNY lace in the remnant bin at The Fabric Store, after waffling about how expensive it was to buy off the bolt. 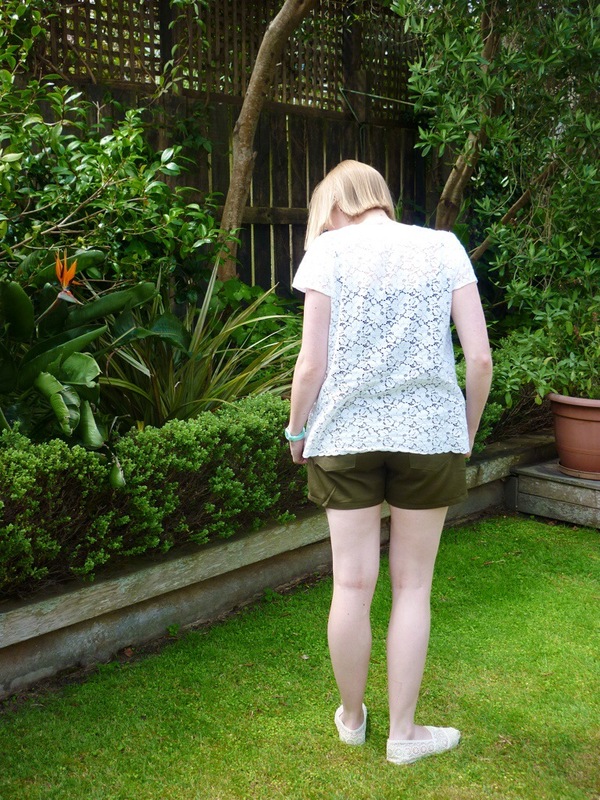 I had just enough for the tee, though sadly I was about 3″ short of being able to cut the sleeve hems along the scalloped selvage and escape hemming altogether! Its all french seamed, as I was a bit worried about sewing over the ‘holes’ in the lace, and the sleeve hems are just turned up 1/4″ and stitched. For the neckline, I didn’t want anything harsh like a strip of white bias tape, so instead I put a line of stitching at 1/4″, which eased it in slightly, and then ironed it over and stitched it down. Its really nice and close fitting, no gaping at all, which I’m sure is down to the initial line of stitching. 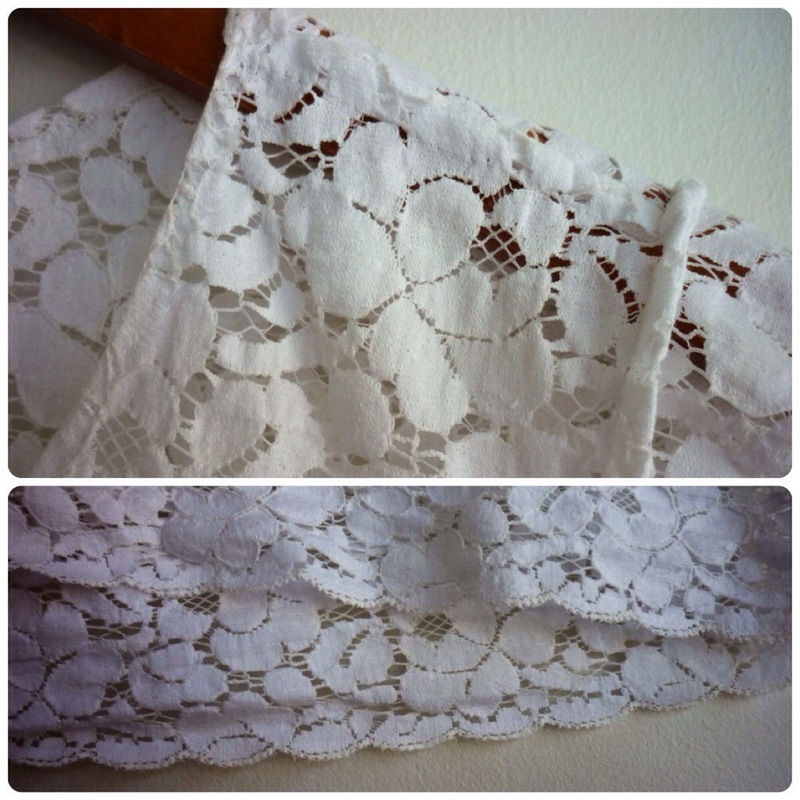 I’m counting on the lace not fraying, or I’ll be in trouble! If I had some sheer mesh or something similar I would have used that to cleanly bind the neckline, but oh well! I love the scalloped hem, its so pretty. I’ve been wearing these two items so much! 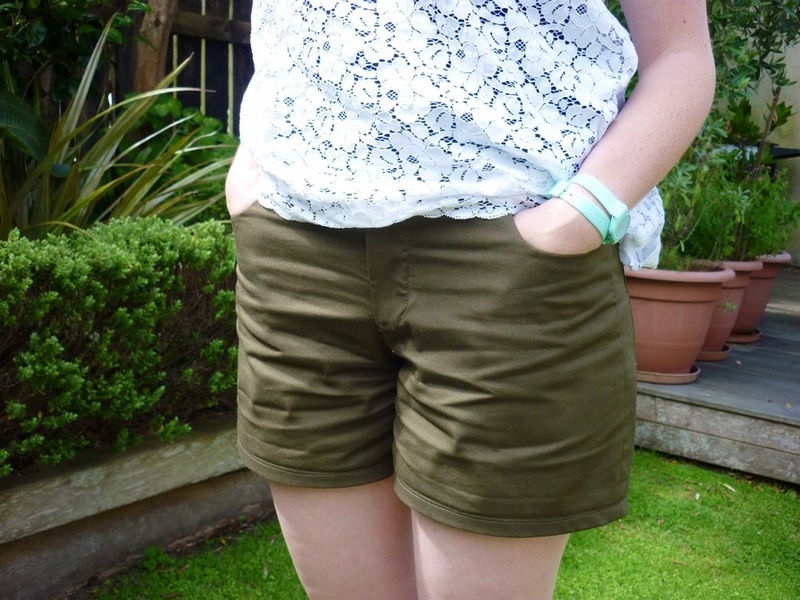 The shorts have been worn every day since I finished them (except for today, since its a bit cooler), and I’ve worn the tee several times (again, not today because its in the wash). They’re both such simple, basic pieces, but they suit my lazy holiday lifestyle perfectly. Hope you’re all enjoying your holiday, if you’re still off work, or that your first week back hasn’t been too much of a shock to the system if you’re already back! I know I seem to say this a lot, but I genuinely think this may be one of my favourite makes so far. 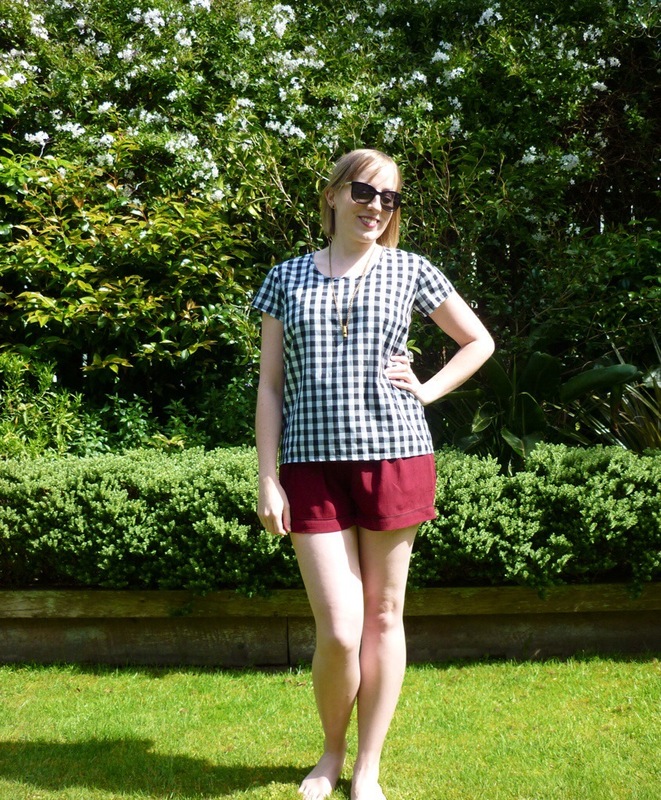 Unsurprisingly, its a Grainline pattern, the Scout Tee. 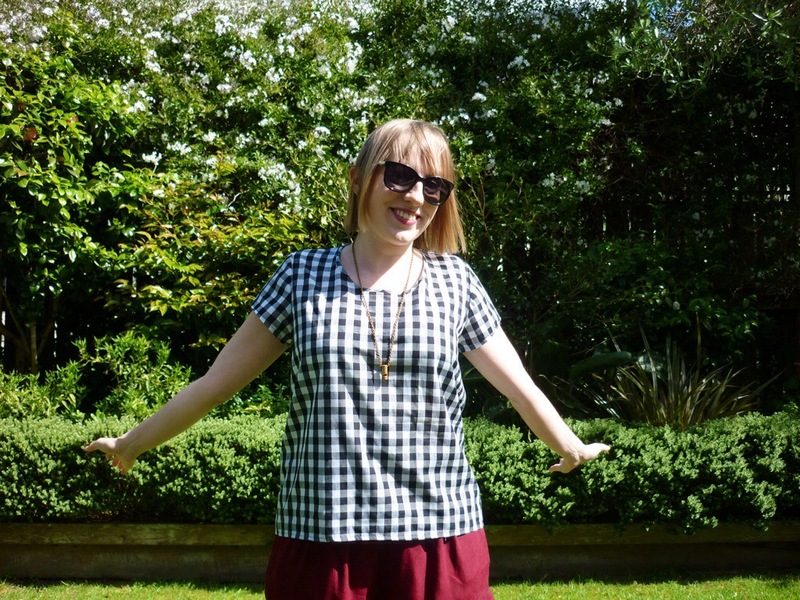 I don’t know why it’s taken me so long to get this pattern, because I love the RTW woven tee shirts I have in my wardrobe! I just managed to squeeze the pattern pieces onto the left over scraps from my Grainline Archer shirt, but only by cutting the back pieces off the fold. Even then, I didn’t have quite enough fabric if I wanted to march the pattern down the centre back seam, which I really wanted to do! 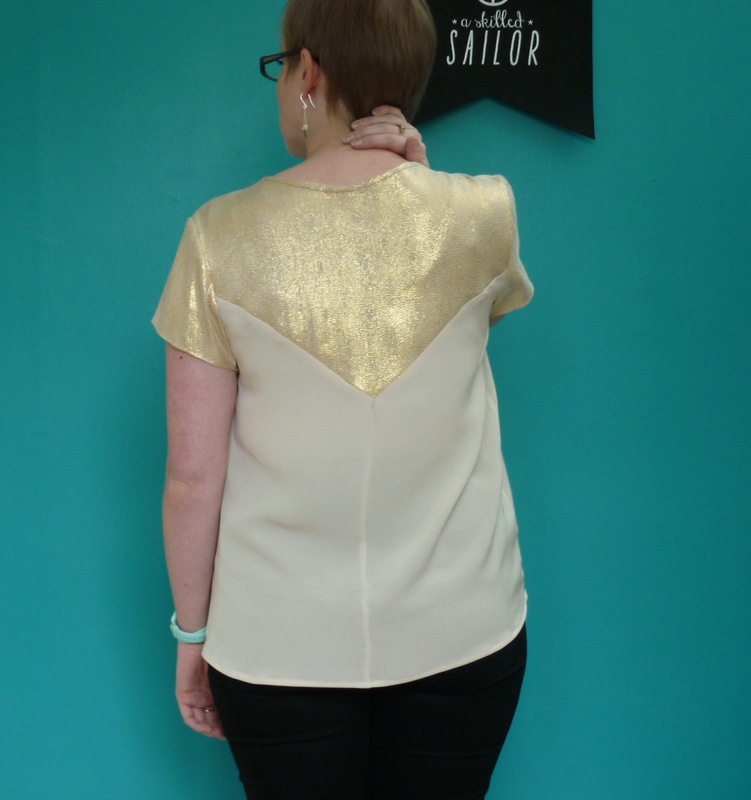 In the end, after a lot of shuffling of pattern pieces and some considerable swearing, I found a way to fit everything on and get the pattern matched at the CB seam, but…I had to add in a cut out to the back neckline. There just wasn’t enough fabric to fit that last little corner on! I actually really like how it looks! 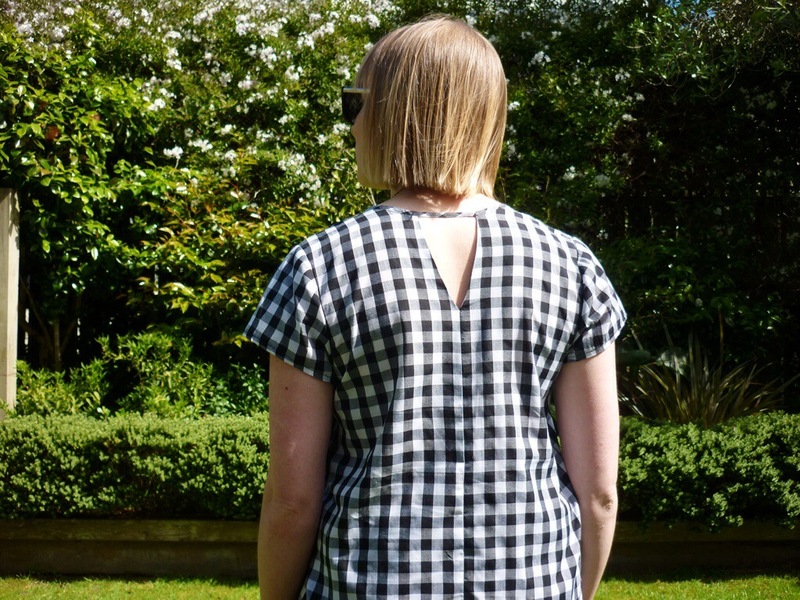 I like interesting details on the back of my tops, especially if the rest of the top is quite plain (if you can call black and white gingham plain!) I elongated the triangle a bit, just to make it look more planned. Because of the cut out, I ironed the neck binding into double fold bias tape (which was such a pain in the arse, it was too small to fit in my bias tape folder so I had to do it all by hand. So many scorched fingertips! 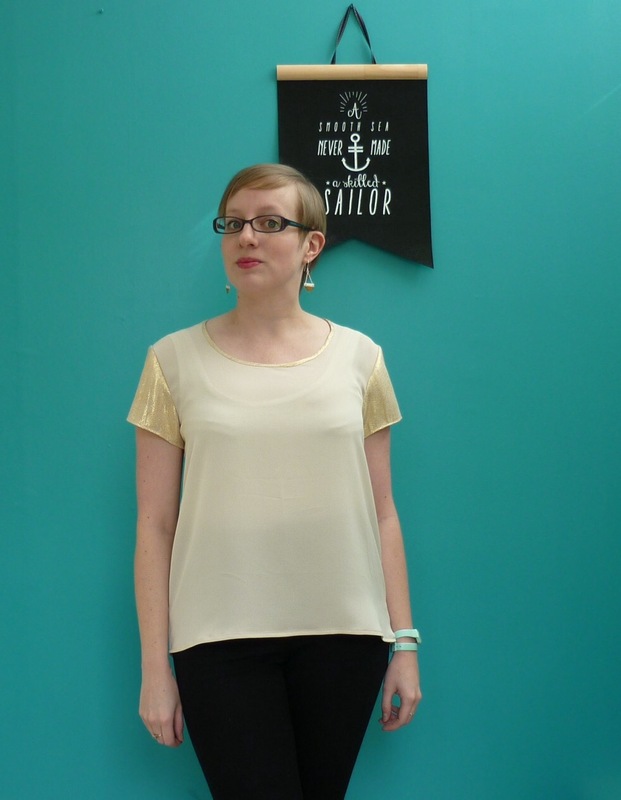 ), and bound the neckline the same way the Datura blouse uses. 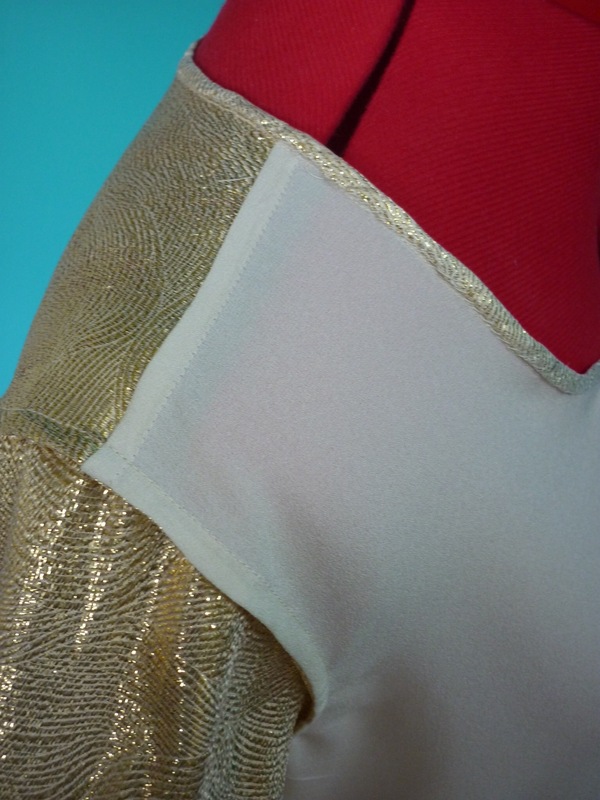 I made a narrow facing for the cutout itself, which was under-stitched to the seam allowance (is that the right term? I’m having a mental block).